On 14 and 15 april 2012, it's time for the big Utrecht Record Fair. This year, it is something special: On 14 april, during the fair, Max Werner will personally donate his yellowgold "Arbiter" drumkit to the Dutch RockArt Museum. Max used this kit during the recording of "Phantom Of The Night", amongst other things. As part of the celebrations of the 40-year jubilee, there is a new single available from the Kayak webshop. That is, it is on pre-order for a september release. 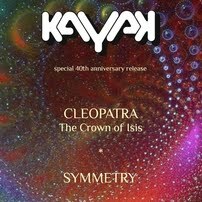 The single contains a preview of the forthcoming 'Cleopatra'-album, plus an edited version of an unreleased song: Symmetry. Symmetry was written by Ton and Pim in 1972, and features the line-up that made the first album.